Donald Trump wasn’t at last night’s C-SPAN Republican candidates forum, leaving the role of boring, bizarre and brash to former Texas Gov. Rick Perry. In 2011 former Texas Gov. Rick Perry ran for president and his whole campaign came to a screeching halt in a Republican primary debate following a huge gaff, in which he forgot the name of a federal agency that he wanted to eliminate. Discussing immigration on C-SPAN last night, it seemed like Gov. Perry had forgotten the name of another important government agency, the Department of Homeland Security. The name of the specific agency that Perry tiptoed around in his answer is U.S. Citizenship and Immigration Services (USCIS). That department oversees legal immigration and, to be fair, is often confused with U.S. Customs and Border Patrol (CBP, they guard borders and ports) and Immigration and Customs Enforcement (ICE, they arrest immigrants and run immigration jails). Yet Perry should know that all of these agencies are part of the Department of Homeland Security, the same agency that oversees FEMA, the Secret Service and the Coast Guard. If elected president, Perry would have to be pretty familiar with these. Instead of saying “that agency” three times in a row, Perry could have guarded his apparent ignorance by saying that DHS’ legal immigration system is broken. By not naming USCIS or DHS, he looked like he didn’t know what he was talking about. It was Republican debate deja vu. Just as a refresher, here’s what Perry said in the 2011 debate (fuller context in the video below). "I'll tell ya, it's three agencies of government when I get there that are gone: commerce, education and the, uh what's the third one there... let's see...."
Fellow candidates tried to help him. “EPA,” they asked. Nope. “You really can’t remember,” the moderator asked. “I can’t, the third one, I can’t. Sorry. Oops,” Perry said. Perry’s performance in 2015 doesn’t look like it’s getting much better. Matthew Boyle of the conservative news outlet Breitbart made a list of his gaffs dodges and misunderstandings of the simple questions he was asked during the C-SPAN forum. Compared to a real debate, Monday night’s forum was friendly and easy going. The C-SPAN event host even gave Perry an opportunity to answer the the 2011 question again, like a sort of Tosh 2.0-style web/cable redemption. “What specific agencies would you either eliminate or cut,” the C-SPAN moderator asked. “I’ve heard this question before,” Perry said with a chuckle. Instead of delivering a solid answer from the strength of four years of preparation he dodged the question, speaking about cutting spending in general but avoiding the names of even a single government agency. 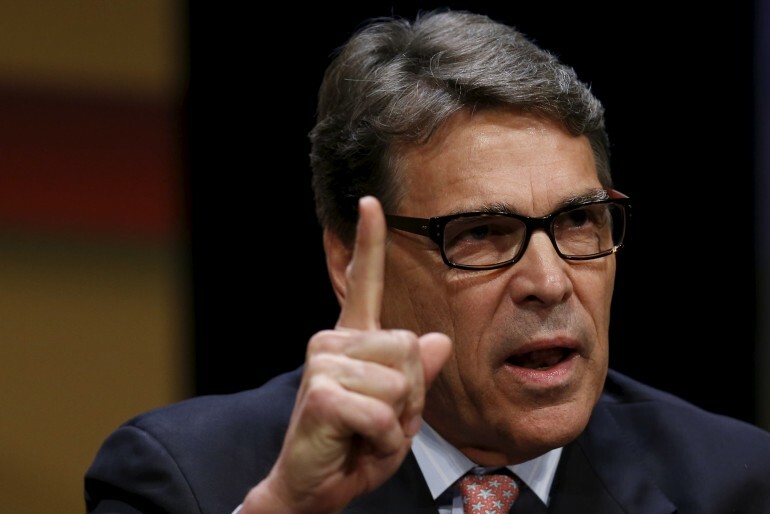 New polls suggest Perry won’t make it into Thursday’s Republican primary debate, hosted by Fox News. With only 2 percent support among national voters, it looks like he will be cut from the podium, making it harder for him to stay in the race. “That Republican candidate” might not have to worry about naming federal agencies on TV any more. Monday's 2-hour long debate. Perry's immigration questions start at the 10min mark.